Two summers ago, Sarah Ahmad ’18 was doing an internship in the greater Chicago area. Every weekend, as a treat, she and her friends would travel into the city to try a new restaurant. Ahmad wanted to make the most out of every experience, so she tirelessly researched her options — only to discover that her diligent efforts led to hit-or-miss results. She could go to a well-reviewed restaurant and still get a meal that was a dud. Or she could find a hidden gem of a dish tucked in the menu of an otherwise so-so spot. It was in those moments that HotPlate was born. “I just wanted to know: what should I order?” says Ahmad (below left). She dreamed of an app that would rate specific dishes at restaurants, not just the restaurants themselves. Ahmad, who is majoring in economics and integrated engineering studies, returned to Northwestern in the fall inspired to address that need. She enrolled in a course called Engineering Entrepreneurship, where HotPlate was just one of six ideas that she and her classmates developed in the class. 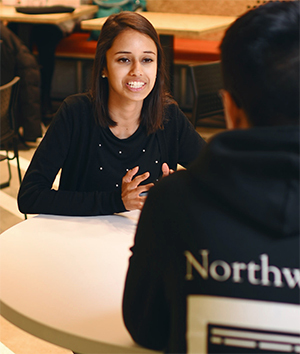 She followed that up with the Wildfire Pre-Accelerator program at The Garage, Northwestern’s hub for student entrepreneurship. And now the smartphone app is in the wild. It currently boasts hundreds of users and individual dish reviews for dozens of Evanston restaurants. Better yet, Ahmad knows that she and her team are just getting started. A background in the liberal arts might not be regarded as essential for an entrepreneurial career. But perhaps it should be. The arts and sciences bring to bear a range of skills, including creative problem-solving, strong communication and the ability to learn new things, that are critical for any entrepreneur. These skills can help transform a good idea into a great one and a so-so company into a successful one. And these companies lead to innovation, jobs and economic growth. Students and alumni at every entrepreneurial stage — from those with the spark of an idea, to those expanding a company, to those exiting successfully — say the mindset fostered by the arts and sciences has provided a crucial edge. SAM KIM ’20 (left) is a born entrepreneur. He launched an apparel company in seventh grade, worked for his dad’s startup in high school, and is running three businesses out of The Garage, Northwestern’s student innovation incubator. 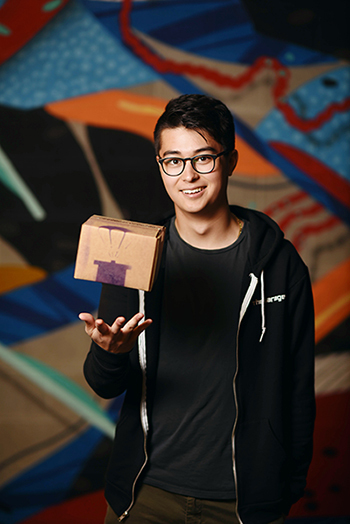 When he arrived at Northwestern in 2016, it wasn’t long before he discovered Launch, a student-run program that helps move students from the ideation stage to a product that’s ready for funding. That was the starting point for Care Pack­age, a service that delivers a box of snacks — a rotating selection of items from cookies and pretzels to oatmeal and gum — right to stu­dents’ doors. While they have stayed true to that fundamental idea, Kim and his team have made plenty of changes in their efforts to hur­dle pricing and business-model barriers. For example, Kim and his team initially imagined Care Package as a subscription for which students would pay $15 to get a box of treats worth $30 delivered to their dorm room every two weeks. That model fizzled, so they tested other options until hitting on a winner. Today, students use Venmo, a smart­phone-based payment service, to send $5 to the Care Package team. Within 30 minutes, a Care Package delivery person will bring snacks to their door. Kim and his team currently sell about 15 boxes a week, and they expect that number to rise when they expand their delivery area from two dorms to three. They dream of developing a tool that doesn’t just make it easy to deliver snacks to students, but also helps companies solve the “last mile” problem of getting goods to customers efficiently. Reconceiving problems is an essential skill that arts and sciences graduates bring to the entrepreneurial sphere, says Billy Banks ’98. A history and political science major, Banks started and ran multiple companies before he became The Garage’s associate director in 2016. “Entrepreneurship is about being comfort­able with risk uncertainty,” Banks says, not­ing that he navigated many white-knuckle moments himself while leading M-Tech, a steel fabrication business. Banks credits his own ability to absorb lots of information — and to make difficult decisions in the face of ambigu­ous or even conflicting reports — in part to his liberal arts education. “Part of that [approach] is about reframing failure, synthesizing new information from disparate sources and draw­ing new conclusions,” he says. Entrepreneurs, like arts and sciences stu­dents, love to look at problems from many different angles and find the unexpected perspective that can provide the insight to solve them. EVAN TAYLOR ’19 (right) was flying home from a family trip to Mexico two years ago when he saw his mom pull a small stack of pesos from her purse. Because the pesos were mostly coins that a currency exchange wouldn’t accept, that money — the equivalent of perhaps $10 or so — would essentially be useless once they arrived in the United States. Even after Taylor, an economics and international studies major, returned home, he couldn’t stop thinking about the problem. So he did a little research and made a few calculations. Some conservative, back-of-the-napkin math revealed the true scope of the opportunity: some 11 million Chicago-area airport travelers likely hauled home nearly $100 million in foreign currency that would never leave their sock drawer. Taylor’s determination to prevent that money from going to waste became the genesis of Community Currency, a nonprofit organization that collects leftover foreign currency at airports and other locations and transforms it into scholarships for underprivileged children. As he built the organization, Taylor soon discovered that his biggest hurdles were not the ones he had anticipated — launching a nonprofit organization, for example, or find­ing a company that would pay scrap prices for metal coins. His most important challenge was finding other groups to buy into his vision and help support it. 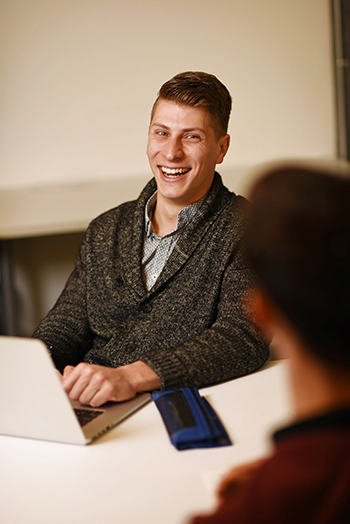 To do that, Taylor found himself returning again and again to the principles he’d learned in his first-year writing course with Barbara Shwom, a professor of instruction in the College’s Cook Family Writing Program. In Shwom’s course, How to Become an Expert in Roughly 10 Weeks, Taylor had learned how to deeply research and understand topics — and to convince others of the value of his views. This proved to be a critical skill when Taylor went into meetings and faced sharp and unexpected questions. Whether he was meeting with the Chicago Department of Aviation (which could help the company get placements in airports) or the Boys & Girls Club (which would get the funds from the work to support scholarships), Taylor sought to help the other party see the value of his vision. He worked to develop clear, concise answers to every question they could throw his way. Shwom, who has kept in touch with Taylor as Community Currency has grown to a team of 12, is delighted that he has been able to put the ideas from her class to work. So far, Taylor has been able to generate enormous enthusiasm for his company’s mis­sion: they’ve landed $20,000 in grant funding, partnered with the local chapter of the Boys & Girls Club, connected with multiple on-campus groups, and are in the midst of encouraging discussions with the Department of Aviation at O’Hare International Airport. Next up, he says, are talks with banks and currency exchanges. BEN WEISS ’17 (below right) had been obsessed with college football recruiting for years. He’d even landed a student job in exactly that area for Northwestern. But it was in an economics classroom, not a recruiting office, that he saw recruiting’s next big thing. As part of his coursework for Schapiro and Morson’s team-taught class, Alternatives: Modeling Choice Across the Disciplines, Weiss had read a Schapiro-authored paper about algorithms designed to predict the likelihood that a given student would enroll at a particular college. Such algorithms are essential, since schools always admit more people than they can accept, knowing that not everyone will actually enroll. To Weiss, it felt like a thunderclap: why not use those same principles to develop an algorithm that could predict where a student-athlete would commit? Though he didn’t have the kind of technology background he suspected he’d need to develop the software, Weiss was pretty sure he could track down people who did. A fraternity brother, Danny Baker ’17, did some of the analytic number-crunching, and a pair of College computer science students, Dino Mujkic ’17 and Gautier Dagan ’17, helped build the platform for the technology. The result was Zcruit, an application that predicts whether a student will commit to a particular school with incred­ible 94 percent accuracy — along with several eager university customers. That 360-degree mindset wasn’t just helpful in getting Zcruit off the ground. It also proved invaluable when Weiss was selling the startup to Reigning Champs, a company that helps connect athletes to colleges. The company now works with 23 Division I football programs, including Clemson, USC, Notre Dame and LSU. Weiss knew he and his team had taken Zcruit as far as it could go on their own. Reigning Champs offered Weiss the chance to work within a larger and more diverse infrastructure, with services for student-athletes, coaches and administrators. That meant Zcruit would fit into Reigning Champs like a puzzle piece, connecting to other services and maximizing its impact. 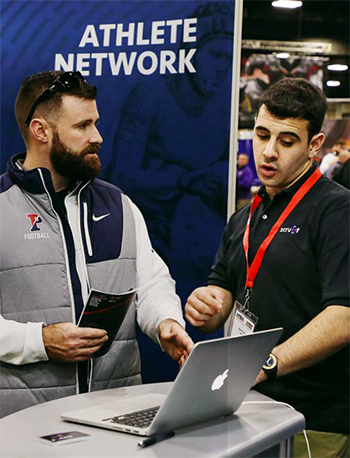 “We built an amazing foundation at Northwestern and now we're trying to transi­tion into the next stage with the new team, to build out a better product and go from there,” he says. If there is a lesson to be drawn from Wein­berg College students and alumni who have built unique and successful businesses, it’s that the arts and sciences mindset isn’t just worth­while. It’s essential. Boundary-crossing thinking can lead to that “eureka!” moment, as when Weiss saw an admis­sions algorithm and dreamed up a way to apply it to recruiting. Deep research and careful case-building can help bold creators find part­ners who can turn an idea into reality, as Taylor did with Community Currency. And the liberal arts’ emphasis on true empathy, not just the bottom line, can help entrepreneurs transform ideas like HotPlate and Care Package into gen­uinely useful and loved products and services. Perhaps most important, the arts and sci­ences give students the tools to learn whatever they need to tackle next, whether that’s read­ing a balance sheet or navigating a legal agree­ment. They encourage students to look at the world in unique ways. And through entrepre­neurship, they can take that distinctive point of view and transform it into a company that can make a difference. The founders of Apple, Amazon and Disney all famously got their start in garages. 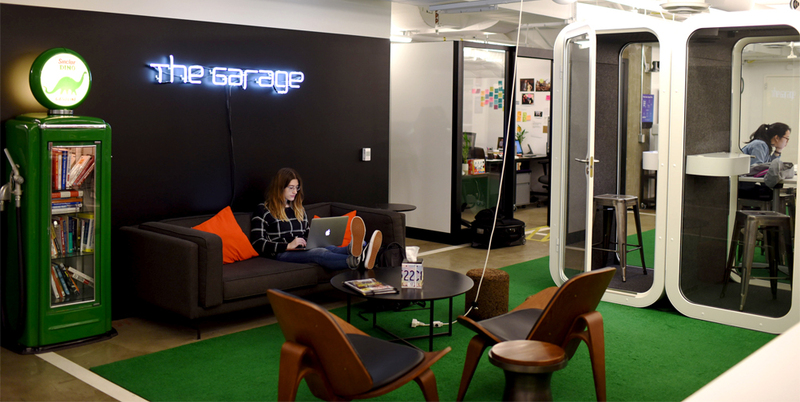 These days, Northwestern student entrepreneurs have their own garage to call home. The Garage, which opened in 2015, is an 11,000-square-foot space housed, appropriately enough, in the North Campus Parking Garage. There, students can seek advice from professionals, get involved in pre-accelerator programs, attend talks and events, and collaborate to build the company of their dreams. This 10-week program helps entrepreneurs learn the basics of product development, pitching and customer connection. At the end of the program, students pitch their ideas in a Shark Tank-type event with expert judges, where a $10,000 prize pool of cash is up for grabs. This crash course in entrepreneurship, run by students and supported by The Garage, is designed to help students go from back-of-the-napkin sketches to real products that are ready for crowdfunding or venture capital investments. Student entrepreneurs can schedule dedicated time with successful entrepreneurs, tax and accounting experts, social media and marketing professionals, and other mentors. In addition to co-working spaces and conference rooms, students can take advantage of the Makerspace, with an augmented reality and virtual reality lab as well as a prototyping lab. Student entrepreneurs can apply to be part of a selective residency program that offers weekly dinners, 24/7 access to The Garage, and a mentor.